Blue Moon Purple Moon Mosaic Tea Cozy Double Insulated Tea Cozy Blue Moon Tea Cozy by Blue Moon Fine Teas at Mystic Oaks. MPN: 1. Hurry! Limited time offer. Offer valid only while supplies last. Purple Moon Mosaic Tea Cozy with a vibrant Mosaic design, in vivid greens, blues and purples with gold outlining the design, and a purple lining. 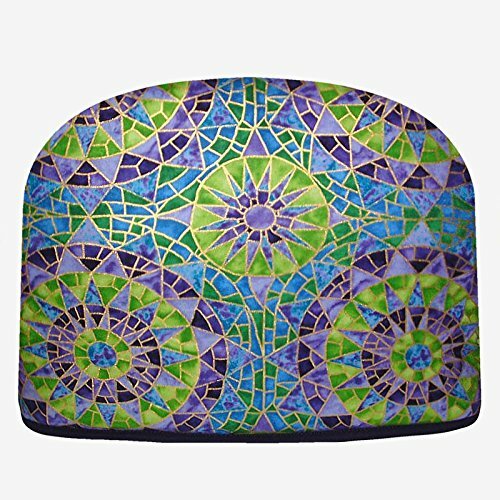 Purple Moon Mosaic Tea Cozy with a vibrant Mosaic design, in vivid greens, blues and purples with gold outlining the design, and a purple lining. Teapot Cozy covers 2 Cup, 4 Cup, or 6 Cup Teapot. Measured from inside 9 1/2 " H x 12" L x 7 W. Made in the USA. 100% cotton - quilted item polyester filled. Contains more insulation than most available tea cozies. Hand washing recommended and lay flat to dry. Teapot Cozy covers 2 Cup, 4 Cup, or 6 Cup Teapot. Also Keeps French Press Coffee Hot. Measured from inside 9 1/2 inches H x 12 inches L x 7 inches W. Made in the USA. 100% cotton - quilted item polyester filled. United States 2-3 Day AK & HI Postal Shipping PO Boxes and Street Addresses USPS Shipping. View More In Tea Cozies. If you have any questions about this product by Blue Moon Fine Teas, contact us by completing and submitting the form below. If you are looking for a specif part number, please include it with your message. Half-Moon Teapot and Tea Strainer Set & Lid Teapot Kettle Kitchen Dining 25.36 oz.